Currently, aortic valvuloplasty (AVP) and valve-sparing root replacement (VSRR) are increasingly being performed in many facilities (Fig. 9.1) [Stamou SC, Williams ML, Gunn TM, Hagberg RC, Lobdell KW, Kouchoukos NT. Aortic root surgery in the United States: a report from the Society of Thoracic Surgeons database. J Thorac Cardiovasc Surg. 2015;149:116–22.e4]. However, a detailed nationwide survey of aortic valve-sparing surgery is lacking. 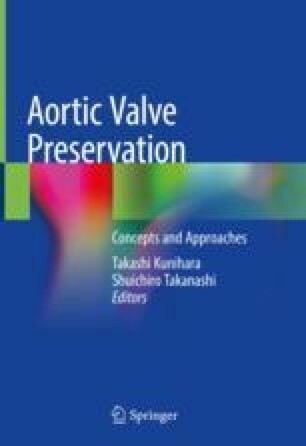 This chapter reviews the current trends in aortic valve-sparing surgery worldwide.